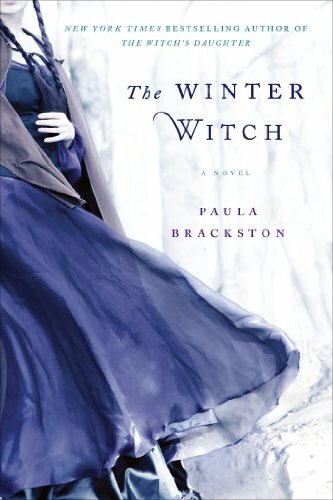 The Winter Witch by Paula Brackston tells the story of a magically gifted mute woman, Morgana, and her new husband by arranged marriage, Cai Jenkins. Although the back cover blurb claims this book takes place in the early 19th century, it felt almost “pan historical,” and more fantasy. There are only details here and there that hint at the time frame, but specific historical context is by no means central to this story. I did not find that a hindrance, however, as the setting of Wales is enchanting and magical in itself. Morgana and Cai’s arranged marriage is rocky at first, as she cannot speak and he often assumes things incorrectly about her. Morgana is, as Cai comes to call her, “wild.” People of her hometown whisper about her magical origins (her father was a gypsy with “magic blood,”) and so Morgana has lived mostly a sheltered life with her mother not only for her own protection, but for the protection of others as Morgana’s raw, untrained power had been vented onto school children and townsfolk alike. As Morgana and Cai’s relationship grows into true tenderness, Morgana must also contend with the dark power of village rival Isolda Bowen. Isolda is sweet as honey and sophisticated on the surface, but her intentions and true identity are far more sinister than anyone in their small town can imagine. Morgana, however, can sense the evil about Isolda instantly–as well as in those she manipulates through magic to do her bidding. Brackston’s narrative is fast-paced and engrossing. Having a mute main character made for a very interesting and unique read, as so much of the story could have been different could Morgana have explained herself and her experiences to Cai or anyone else around her. Cai surely must get a trophy for the most patient husband! I also enjoyed Morgana’s ability to converse with the animals on the farm: from the energetic corgis, to the beautiful ponies grazing in their fields. The Winter Witch is a thoroughly enjoyable read, and a quick one at that. I will definitely be checking out the rest of Paula Brackston’s Witch books!